The family weekend was really special. 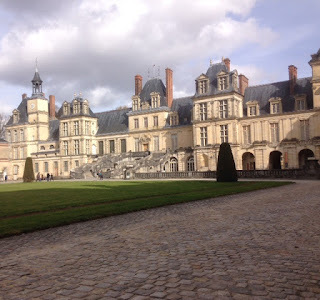 I enjoy history, especially European history, so going to the Fountainebleau castle was interesting for me. I could finally apply my Napoleon knowledge from the US to something. I even have a book in French explaining the history of the castle, so I can actually learn of its importance instead of just playing tourist. Friday we stayed pretty much the whole afternoon at McDonald's meeting one on one with my friends/family from my old region. In the evening, we met with my host parents' friend at a restaurant. Before heading back home the next day, we met up with some of their other friends. We even got to meet their pet boa constrictor! Just one side of one part of the Fountainebleau castle! With all of my host sisters just outside the castle! Sunday evening we gave Ayelen back to her host family, and she left us a beautiful note thanking us for having her. We connected really easily with her, but she lives about an hour and a half away from us, so I am anticipating April when we will all see her again at the AFS weekend. I thrilled my classmates by doing a presentation on my life in the US: school, the Amish, the differences between the countries. Before giving my opinons on the country differences, I asked the students what they thought of the US. The answers were as expected: It's big! It's like lots of different countries in one! There are lots of different landscapes! You eat lots of greasy food! Hamburgers! It made me laugh seeing their true interest when I was just explaining my everyday life. Everyone told me they understood my English, which means I spoke at a reasonable pace and used simple words. I feel like my house is a museum now. We have a flag for each country my host parents have hosted from and also a flag just for Pennsylvania. I did not even know that existed before last week. Honestly, I never really thought about it. The two dollar bills I gave my host dad are now in a frame with decorations hanging in the dining room. I have my own French flag in my room that my grandma made. I think we still have room for other decorations if we want to completely make the white on the walls completely disappear! I went to a professional basketball game last night with my host dad, and we had nice seats near the front. It brought back fond memories of when I went with my grandparents to my cousin's basketball games in the US. There were actually lots of US players on this French team as well. My host dad said our team didn't play well at all in this match, and they lost, but I actually found the coach's behavior of the winning team as interesting as the game! I finished school early today because it Wednesday, and my AFS friend was able to join us for lunch. It seems much simpler to just eat together in the school cafeteria, but our schedules almost never allow that! I'm dedicating my afternoon to studying, or at least some of it, and maybe I'll do that schoolwork I've been "putting off" for....three weeks. Some things never change! No, I have actually been busy with other things just as important! Standing around the kitchen in France eating chocolate chip oreo cookies and drinking Dr. Pepper is so weird. Sunday, we had an "American snack", which I thoroughly enjoyed. I'm even surprised how sugary my own land's food now seems to me. I think it could go to contest with the "sweetmilk" of Argentina! Wearing slippers around the house still doesn't come naturally. One thing I noticed when I got to France is that French people do not merely walk around in socks or bare feet or shoes. Of course, that depends on families, like everything else, but in the three families I've lived in, everyone wears slippers or crocs. In fact, shoes are rarely worn in the house. Maybe slippers are worn just because it's cold outside, but solve that problem in the US, I just put on ridiculously colored"fuzzy socks" that I would never wear outside of the house. I don't mind wearing slippers. It just doesn't come natural. To this day, I will still go out to the garage to get something in my white socks. I finally got one compliment for my French accent. Yes, I said one and I meant one, but it's still progress, right! Don't worry, I'm still working on it. I know I'm not even close with the accent! Sometimes you don't have to talk. I came across this strategy in the middle of February when I was with all of the AFSers of this region for the first time. Of course, in my mind, trying to integrate myself meant starting up a conversation or putting myself into a group. My host dad suggested something very obvious....that I just sit, listen, and try to learn something. Following this piece of advice, I quickly found myself following along in a conversation about languages and even able to join in a little. It's amazing how you don't think of the simplest things until someone points them out. I've learned how to listen. Whenever I get the question of how studying abroad has changed me, after careful thought, I reply that I'm probably a much better listener, and more patient. (I got the question from Ayelen two and a half weeks ago.) I think this change comes from the fact that when I arrived, I didn't know what I was doing, and there was no pretending! I had to trust other people to help me with the simplest tasks. I got used to listening carefully because it took extreme concentration just to understand a simple question in French. Over time, and after six months, I've also seen how what people said about studying abroad is true (such as general French culture tips and advice on how to handle long distance relationships back home). Overall, these two things have changed my willingness to listen to others and also my attention span. Now, when I joke with my host mom that I am always right, it's really just a joke! This Saturday, I am going with my host parents to an AFS event for future AFSers. They're right. I was told before I left for France that now I'm in the AFS bubble. Either I'm preparing for my year abroad, I'm in it, I'm readjusting to my home country after my experience (next step), or I'm thinking about how I can advise and help future participants. That's ok. I wouldn't change this honor for the world! I'm living my dream.